Discussion in 'Taylor's Tittle-Tattle - General Banter' started by zztop, Jun 28, 2017. I sincerely hope that the police officers that made the split second decisions that contributed to the disaster do not get charged in that regard. I believe they made them for the right reasons - to relieve the problems at the gates outside. But if they, or others, lied under oath or changed evidence to cover things up then throw the book at them for that - as they will deserve it. But I also hope that those football fans that know that they also contributed to it by pushing their way in to watch a football game and crushing those at the front, are reminded of their own culpability. Of course, they will have suffered an element of guilt over many years, regardless of what the various enquiries have found since then. Hopefully they will have passed on some of their regret to their children. Reckless actions at huge public events can have serious consequences. Beekayess, NemoNemo, Otter and 6 others like this. I don't think there is anything else that can be added to this. 6 charged including some for covering up evidence and the main man at the time David Duckenfield. Guess this is the final part of justice Liverpool fans (I doubt anyone is going to feel any guilt themselves given what has been proven since) want - to see those involved go to jail. I remember you saying this about a year ago when the unlawful killing verdict was ruled. You were told then that it was completely untrue and at odds with all findings made by investigators. Why do you continue to repeat harmful slurs that you must know by now to be untrue? The crowd outside of the stadium weren't pushing because they were trying to get into the stadium or because they were trying to cause trouble. They were being crushed due to poor crowd control, where in contradiction of usual procedure, the crowds weren't filtered. As a result, the Liverpool fans outside the turnstiles were so close together that they could hardly breathe. If you put anyone in that situation they are going to move around to try and find space and relieve the extreme pressure that they are under. The police, to their credit, realised that action had to be taken before supporters died and decided to open the gates to the ground. CCTV shows the Liverpool fans then walked through these in a fairly orderly fashion. I assume this is the ''pushing their way in to watch a football game'' and ''reckless actions'' that you are referring to? It should also be noted that the Independent Panel found no evidence throughout the entire, extensive investigation, which analysed video and documentary evidence, there was any suggestion of notable misbehaviour, violence, ticketlessness or drunkenness from Liverpool fans outside or indeed inside of the stadium. There was also no evidence found that showed that Liverpool fans attempted to force their way into the stadium. The next incorrect thing you said is that those who got in late ''crushed those at the front''. The truth is that the stand was not over-capacity. Had the fans been directed adequately towards the two empty central pens after the gates were opened there would have been no issue. However, they were sent into two already full pens and by the time that they had entered the tunnel to these pens there was no way back. It was not a case of pushing here either. The bodies were so close together that movement was impossible. To give you an indication of this, the majority of those in the pen died through not being able to move their chests enough to breathe in. You refer to those at the front being killed in part due to the reckless actions of those who had supposedly pushed at the back to get in. Untrue. The majority of those who died were those who were let in after the gate had been opened by the police at 2:55. The most severe crushing occurred at the back of the stand, near the tunnels to the overcrowded pens that fans were incorrectly sent through and this is where most of the deaths were. Moose, Simmos, PhilippineOrn and 5 others like this. Probably not the thread to rake this all over again. These people have been charged. They are yet to be found guilty and as ecases are ongoing we need to be careful what is written and published. I'm not talking about the guilt of those charged today. I'm talking about the inaccuracies in zztop's post about the actions of the Liverpool fans that day, which have been conclusively debunked time and time again yet still get repeated as fact despite there being no evidence to back it up and plenty that shows it to be inaccurate. I have edited my above post to provide more detail and I encourage everyone to read the report or the summary on the link provided. I think youve got a few things mixed up here JB tbh. The two central pens (3&4) were where the crush occurred. And are you sure that "The most severe crushing occurred at the back of the stand" Only everything ive seen or read suggests most people died because of being crushed by the fences at the front? The crush barriers at the front also gave way.. supposedly after a Liverpool attack lead to more people trying to get forward. People were also being pulled up to the upper tier from the areas around the tunnel. That could not have been possible for the poor sods at the front who were too crammed in. It's right that charges have been brought. Many of us have to make split second decisions in our work and sometimes - such as on the railways - these can be life or death decisions. When such decisions are made incorrectly and catastrophically so that large numbers of people die, then it is right and proper that appropriate charges should be pursued against the culprit - however powerful he or she may be. Where there is evidence of lies being told in an attempt to whitewash or obscure the poor decisions made, then it is right and proper that charges are pursued to prevent the same from happening again. I Blame Bassett, HappyHornet24, Heider Hyde and 3 others like this. Bang on. Negligence is negligence but it has to be proved. Yep, sorry you're quite right it was the two central pens that were congested. The side pens were the ones that were left semi-empty, not sure what I was thinking. The majority of deaths definitely came from people who entered the stadium at or after 2:55. A number of people obviously died at the front as well, but in the report it states that the most common cause of death was compression asphyxia rather than injuries caused from crushing and the majority of people who died were let in after 2:55. I believe it goes into detail about the exact location of deaths and it shows that more people died in the middle and back of the pen than at the front, but it has been a while since I read the report in it's entirety so I'm a bit hazy on some of the more specific details. Obviously it's possible that some of these people were able to get to the front after entering the stadium at 2:55, but the point is that the commonly trotted out view that those who were in the stadium early (i.e: Before the gate was opened) were the only ones who were killed is incorrect. It's important that a distinction is made there because the incorrect suggestion that Liverpool fans forced their way into the stadium or created a situation in which they were in anyway culpable is basically saying that the majority of victims were responsible for their own deaths as well as the deaths of others. Jossy and Stevohorn like this. In my opinion, a split second decision, such as a bus driver who tries to avoid one accident, by taking action which then causes a different accident and deaths should not be charged with manslaughter, or a BR worker that tries to avoid a crush during the rush hour, but his decision causes a crush elsewhere is a similar case. Such decisions will not be stopped by a conviction. They are made by people who try and do their best at the time. But I suspect that this Duckenfield charge may be a result of a number of decisions he made, one after another, starting with the his preparation for the event. Which is fair enough. I'm not going over the crowds culpability again. As we did that ages ago, but to quickly explain my thoughts expressed earlier. it was definitely very difficult for an inquest to blame "the crowd". There were thousands of them, many of whom didn't try and push their way in, alongside those that did. Difficult, even impossible, to blame people in those circumstances and it would have caused an uproar if the inquest had. But I have been in countless crowds going into stadiums and venues where there has been serious pushing with little regard for those inside and I can think of several occasions where police and stewards had to shout at the heaving crowd to stop pushing because of the danger up front. It happens often and the very fact that those poor people were crushed by other people, not by structures collapsing on top of them, demonstrates that the pushing crowd is at least partly to blame. As I said earlier, only the individuals involved know how much they were pushing. Those that weren't, and were carried along by the crowd are entirely blameless. But I personally think it is wrong that any crowd entering a stadium has carte blanche to push their way in, regardless of the consequences to those ahead of them - merely because someone opened a gate. Of course, i recognise that others have different views and think that only the police should bear responsibility, but having been in similar situations myself, I wouldn't change my mind, as I think everyone has a personal responsibility to enter such venues responsibly. Meister, Otter, Aberystwyth_Hornet and 1 other person like this. If it was split second decisions there is a case for believing those at the top acted with the best intentions. Unfortunately it appears to have been a catalogue of errors exasperated by actions of those at the top in both the immediate aftermath and years after. That is what makes their actions utterly unforgivable even if in a court of law they may not be guilty. That's why they all have training, so split second decisions taken at the time have prior thought behind them. (COSHH as its known now ). They had also been warned by prior incidents. And Safety certification for the ground had run out. Keep on running the risk and it will find you out. People in flats are suffering from this now. You are aware that there is publicly available CCTV footage that disproves all that you are saying? The fans walked into the stadium in an orderly fashion. They went into the stadium after the gate was opened because that was the only alternative to being crushed outside. You are being wilfully ignorant and ignoring an extensive amount of evidence because it doesn't fit in with your blinkered outlook. It was an Independent Panel, which was shown all the available evidence. Statements taken from police officers who were on duty, other fans, ambulance crews, stadium staff etc. All relevant CCTV footage was viewed and presented. To suggest that evidence of fan culpability was ignored to avoid 'uproar' is ludicrous. I don't believe for one minute that you are stupid enough to believe that. This report has led to 6 people being criminally charged, imagine the 'uproar' if it came out that fans were responsible, but evidence had been swept under the carpet and the panel had been advised to act in a certain way. You can talk about your own experiences all you like, the truth is there is not a single piece of evidence to suggest that that was the case that day. If there was it would have been found and used as you well know. You also keep talking about how pushing fans were the cause of people being crushed to death. Again, you are completely wrong. The amount of people in the pen meant that any movement was impossible. People died because they were unable to expand their chests enough to breathe. If they can't do this then what makes you think that they were capable of pushing others? Look at the footage and you will not see movement in the pens, you will see people completely motionless being crushed. You are wrong and you are peddling harmful lies that the victims of and families affected by this disaster have dedicated their lives to fighting against. Most people, myself included, have been big enough to hold their hands up, appreciate the vast evidence and admit that they were wrong. It's a real shame that you are clearly too stubborn to do the same. You are arguing that black is white at this stage. I'm not peddling anything and you know it. I have spent hours watching the footage and reading all the reports, like many others. I am just saying publicly what every sensible person really knows, but prefers not to say. If the police hadn't let people through the gates and if those people hadn't then tried to get in to the ground to watch the game that had already started, then no one would have been crushed inside the ground. I don't see how anyone can argue with that. If they are arguing with that, why was opening the outside gate so crucial? An independent panel came to the best conclusion they could in the circumstances which was not to point fingers or punish a grieving community any more, as they were suffering enough. There would have been no point in trying to identify sections of the crowd to blame for unlawfully killing their fellow supporters - so they chose not to. That doesn't hide the obvious reality. I policed the 1989 Cup Final between Liverpool and Everton that year, just like most previous finals in the 80's and the police weren't even needed, the crowd entered the ground like they were filing into church. Usually there was a lot of pushing and shoving to get into the lower tiers at the old Wembley, but not that that time. They knew. But what we have here is merely a difference in how you and I see personal responsibility. You believe that those people flooding in have no personal responsibility for their own actions as someone opened a gate to let them in, whereas I think they do. Plain and simple. I could give you many, many examples of railway staff in particular who were jailed for making a mistake. Most particularly drivers passing a signal at danger and signalmen's errors of judgement. Finally I recall a Euston guard who got 18 months because whilst working the notorious overnight Manchester/Liverpool to Euston train (always containing large numbers of 'eh mates' who don't believe in buying a ticket) he got into an argument and a scuffle with some Scousers and then on the platform at Crewe, in the pitch dark, some plain clothes cops came running towards him and he gave one of them a roundhouse on the chin with his Bardic lamp. That was a disgrace that was. We'd been protesting about the situation of 1 poor guard trying to collect tickets from 200 scousers on that particular train for a long time. Cut no ice though. Sacked and went to prison. If the gates hadn't been opened the crush would have been outside. Who's fault would that have been? As ZZ says this type of decision whilst tragic is made on the spur of the moment and made to the best of one's ability & training. When making a decision like that you're not thinking about possible prosecution, you're using your knowledge, training and experience to best try and manage the situation. If there has been a cover-up and laws broken to cover peoples backs then fair enough. That prosecution is in the public interest, if you're charging someone based on the decision then unless it was found blatantly negligent (from independent expert inquiry) all you're doing is creating another reason for people not to do this type of job. In that instance you're not prosecuting in the public interest, you're prosecuting in the interest of people that whilst sadly have experienced loss, want revenge not "justice." It's difficult to do but emotion needs to be taken out of it. So let's examine the charges brought with this in mind. Lets remember that all are innocent until proven guilty. That's a matter for independent inquiry analysing the decisions made given the circumstances presented. If this decision process and management of the situation is found negligent then throw the book at him. But has anyone actually suggested what the proper procedure given the training at that time should have been? His decisions need to be compared to that rather than to hindsight. If H&S legislation was breached, he was responsible for enforcing it and those lapses contributed to the disaster then surely he should be up on the same charges as Duckenfield? In my mind that's negligence which contributed to deaths. These are about trying to circumvent the legal process for some gain. Personally I feel these three should be tried away from the media circus as it's legal process rather than this emotive case that are the primary prosecution motives. The cases are not about the deaths but circumventing law afterwards. So far I note that the investigations have cost nearly £100m. Yet again it is the lawyers that profit. There can be no liability directed at the Hillsborough crowd based on the evidence and the conclusion of the independent enquiry. However the attitude of the police and wider public to football supporters at the time was that they(we) were animals and could be treated as such. There was a dehumanisation of a football crowd. They were just seen as a threat to law and order and the public at large. Anyone who was involved in football violence shares some of the responsibility for that attitude. I hate revisiting historical events because you lose the context. The police actions on the day were incompetent to say the least but I've no doubt that they did not set out to harm anyone. Their mindset would have been primarily to keep the fans apart and stop any hooliganism. It is why they were initially slow to respond to the plight of the Liverpool supporters. Their instinct would have been that it was trouble and it needed containing. The fact that it is now an historical event and was not properly investigated at the time was down to a police cover up though. It was easy for them to play on the perception of football fans at the time and use the more than willing press and Tory government to blame the fans rather than accept their own mistakes. Anyone found to be involved in the cover deserve to be prosecuted and punished. Heider Hyde, KelsoOrn and iamofwfc like this. As someone who works outside the Vic on matchdays I've seen a lot of antics from chancers the last couple of seasons. Away fans trying to get in without tickets, into the wrong sections, pleading lost and forgotten tickets (sometimes genuinely), buying tickets from touts (many invalid anyway), selling tickets to touts, being touts, trying to get hold of wristband passes and being too pissed to get in. Probably not an exhaustive list. The latter either get sent to the Oddfellows (away pub) if not completely steaming or get lifted if falling over. Now in some of those categories, the Scousers (red ones) haven't been partlicularly worse than any others. Being pissed for example and even for the last evening fixture on a bank holiday. But they have been particularly keen to get in by hook or by crook. There were 20 or so at the NW (hospital) corner last time with tickets for the family enclosure or GT. Obvious away fans. Two hours early (just after their coaches had arrived), scouse accents and furtive. But they had valid tickets so got in and didn't cause any truouble. We also had quite a few Hammers who got into the 'home end' last year and caused plenty of trouble. The causes of Hillsborough were multifarious. Poor stadium design, no escape from the pens onto the pitch (criminal), a poor police op. (Duckenfield, first time up, hadn't apparently taken any advice from colleagues who'd done the job previously), no stewards to direct the rush to the right pens and generally treating football fans like vermin/cattle. And then the appalling attempted cover-up. But if you're telling me that those milling around outside the ground didn't include any who didn't have tickets, pushed straight ahead to the two central pens regardless and kept on pushing or who were too pissed to care or all of those then I simply don't believe it. Things have improved since then but much of it (from Liverpool fans) still goes on. The city of Liverpool is very good at passing the entire blame and there was plenty to blame. But they're also very good at not taking any blame themselves. Some of their own will have been partially responsible for the death of their own. They should admit that. iamofwfc and Otter like this. like many others. I am just saying publicly what every sensible person really knows, but prefers not to say. Whilst I do understand your opinion to some extent I do find this comment to be unnecessarily antagonistic. I count myself as a sensible person and yet I do not believe that pushing by the crowd led to the deaths that occurred that day. How can I make such a bold statement....because the Inquest concluded so based on three key facts upon which the verdict of unlawful killing was founded. The deaths were caused because too many people were allowed to enter the tunnel leading to the already overcrowded central pens (fact1) from which no-one could escape once past the top step of the terrace due to the pen/fence design (fact 2). Exacerbated by the tunnel being a defined slope towards the terrace (fact 3) increasing the pressure. Only these three factors matter. Resolve any one of the first two points and no-one would have died, resolve the third point and the death toll would have been less than 96 (although the tragedy would still have occurred). People have a responsibility for their own actions and the subsequent impact on others - I agree 100%. But in this case the inquest spent days, months and years reviewing the facts and found, correctly in my view, that fan behaviour was not a contributing factor to the deaths occurring. But has anyone actually suggested what the proper procedure given the training at that time should have been? Absolutely no one is as you well know. It seems you are now basically saying that the fans are culpable for the deaths of others purely through being present in the stadium to watch a football game that they had tickets for, which I'm sure you don't need me to tell you is an absolutely absurd and frivolous line of argument. What did you expect them to do? See into the future and know that the pens they were shown into were already full beyond capacity and not walk through the tunnel? The report suggests the police would have been at fault for not using the standard filtering system that was used at all high-profile football games as the fans approached the stadium, which usually resulted in there not being a massive build-up of supporters in one contained area. This. I genuinely find it quite astonishing that someone can not only argue otherwise, but also manage to delude themselves into thinking that all 'sensible people' know otherwise to a Panel who spent months hearing all available evidence, statements and facts (which have since been published and are publicly available). Apparently there has been some sort of conspiracy to not only completely absolve Liverpool fans of all blame so as not to hurt their feelings. I'd like to hear him explain why this conspiracy didn't extend to keeping the cover-up, which implicates the media, the police and politicians, under wraps. Staggering arrogance. Ok, I accept your first sentence. I should have put many or most, rather than "every". A criminal trial is often deemed to be "unsafe" if merely one comment prejudices the trial. That is why a jury is often shut away from communication during the trial. The reasons are that a jury can get swayed by things they hear, public opinion, the media, pressure groups, etc, etc. In the case of this particular inquest, there had been many years such things. The panel who made this inquest judgement could not have helped this but cant have avoided being influenced (even subconsciously) by everything they had heard and seen. As we know, courts make wrong decisions, so do inquests, and that is even more likely when it has all been held in such a blaze of publicity like this one. So, in my opinion, the inquest verdict does not have to be accepted 100%. Your main paragraph seems to ignore the fact that people have minds of their own. You say "too many people" but those people are not minnions. People can get crushed, so those trying to get in and hitting a wall of people in front, should have stopped trying to get in. I am not, in any shape of form saying that anyone inside the ground before the game started (approx) is in any way to blame, but those that tried to push their way in to the full pen after it started may have been at least partly culpable. But it would have served no purpose for an inquest to have pointed that out (in these circumstances). People can get crushed, so those trying to get in and hitting a wall of people in front, should have stopped trying to get in. I am not, in any shape of form saying that anyone inside the ground before the game started (approx) is in any way to blame, but those that tried to push their way in to the full pen after it started may have been at least partly culpable. Yes, you're right, it would have served no purpose at the inquest. Because that literally didn't happen. It's something you've made up in your head and convinced yourself occurred despite absolutely no evidence supporting it. On that occasion the away terrace wasnt full so it didnt cause any problems.. but what if it had been overcrowded? It wasnt a one off either.. Liverpool fans (among others) were reported to have done the same thing many times over. Also anyone who was going to football back then will remember that many fans were a lot more lawless than they are today and were treated accordingly by the police. Sadly this vicious circle often impacted on more lawful supporters as well. Therefore.. in the aftermath of Hillsborough a lot of people presumed that this scenario would have been a factor in what happened.. it was pretty natural to think that way. But.. several reports have come to the conclusion that unruly ticketless fans were not a factor. But is that entirely correct? There certainly was a lot of pushing and shoving outside before the gate was opened. A dangerous build up of people? Yes, it was getting that way. Ive also read reports of police horses with cigarette burns and remember seeing footage of horse mounted officers being pelted with missiles. JB was right in saying that once the gate was opened people came through relatively calmly. But then what happened after? We havent seen any footage from around the tunnel area.. so who's to say? I'm guessing they came to the conclusion that ticketless fans were not a factor because the terrace wasnt overfull across all the pens. But i cant see how they would know if ticketless fans trying to gain access helped the dangerous build up outside or not? I dont believe there was any checking of tickets prior to getting to the turnstile area. It's also well documented that Liverpool fans were let into the Leppins Lane end even though they had purchased tickets for the Forest end. I wonder if anyone really kept a check on how many got in that way. In conclusion ive always felt that blame associated with any fan behaviour has been whitewashed.. in order as to not upset either the families of victims or LFC. I cant personally believe that on this one occasion all fans suddenly turned into angels. But.. and it's a big but.. All accidents and disasters have a number of factors as to how they happened. Nothing ever happens in isolation. While i believe some fan behaviour that day (namely before the gates were opened) had some influence on events it was of a very minor consequence. The handling of events by the authorities, coupled with unsafe stadiums and the general atmosphere around football fandom back then were the major factors in the Hillsborough disaster. Sometimes though i do wish someone would put up a hand and admit that the initial behaviour of some fans may of helped to set the ball rolling for what subsequently happened. They never will though. The fact is there is no footage or credible statements that back up any of that. If you have a link to the footage of horses being attacked outside the ground or statements that confirm this then I'd appreciate if you linked it here. To the best of my knowledge none of that was put before the Panel as it certainly wasn't mentioned in the report. If it did exist it undoubtedly would have been. People keep repeating the meaningless mantra about how the fans have to take some of the blame and how some of their actions had some impact etc, yet are unable to provide evidence for this. Please, if you have any share it with us here so that we can see it. I would love to see it and learn something new. The footage of the crowd outside the gate suggests that pushing and shoving took place before the gate was opened. However, when there is a dangerous build up of people who are struggling to stay on their feet, finding it difficult to breathe and trying not be crushed this is a natural, unavoidable response. It should be noted that despite these conditions it has been established that no overly unruly behaviour took place and the Liverpool fans were simply trying to stay safe rather than causing any trouble. Once the gate was opened it was a very short walk to the tunnels. We're talking a matter of yards. It is extremely unlikely that anything occurred here that would be different to what occurred outside the ground. Again, if it had done then it is very likely it would have been heard in the numerous extensive inquests that have been carried out since. Had there been a large number of ticketless fans trying to enter the ground then it stands to reason that the Leppings Lane end would have been over-capacity. The fact is though that even at its fullest that day it was still always under-capacity. After the gate was opened people walked in without their tickets being checked. Had there been a massive number of ticketless Liverpool fans outside the ground they would have been able to walk in without a problem, which would have obviously led to the stand being over-capacity. I'm not sure how you can say fan culpability has been 'whitewashed' either. The Hillsborough Disaster is unique in the respect that the victims were demonised and blamed perhaps more so than any other event in UK history. The media, police and politicians colluded to unfairly place the blame on Liverpool supporters and it has only been in the last few years after decades of tireless campaigning from the families that evidence has been allowed to come to the fore that has shown this to be the case. The attitudes of some on here show that those lies made all those years ago are still effective, even with cast-iron evidence proofing otherwise. You say "too many people" but those people are not minnions. People can get crushed, so those trying to get in and hitting a wall of people in front, should have stopped trying to get in. I am not, in any shape of form saying that anyone inside the ground before the game started (approx) is in any way to blame, but those that tried to push their way in to the full pen after it started may have been at least partly culpable. ZZ. I don't want to be argumentative with you as I know the thrust of your opening post was genuine - that individual coppers shouldn't be prosecuted for having to make difficult decisions in very difficult circumstances. I totally agree and thankfully that has not happened. However I feel your paragraph above has missed three vital pieces of evidence. Firstly that the only obvious way to get from the turnstiles to the terrace was down the tunnel. The alternative signage to go right around the whole stand to the corner was not obvious, the route directionally counter-intuitive to normal fans, and the tunnel could have been, but wasn't, closed off (as had occurred in 1988). Faced with this in front of me I know which way I would have chosen to go (and indeed did so several times in the 80s with Watford). Moreover several fans gave evidence at the Inquest (I read four accounts, not sure how many in total) that they tried to do exactly what you suggested but couldn't. In the seconds it took them to realise the seriousness of the situation that was occurring they found it impossible to turn round. The were hemmed in, swept off their own feets in some cases, crushing down the slope to the terrace and in their own fight for survival. Sadly fans died in the tunnel as well as in the pens. And thirdly that once in the tunnel and deciding you had to move laterally to avoid crushing in the two central pens you simply could not do so. There were walls either side of the exit onto the terrace extending approx 1 metre. Fans had to push forward to get around and back up to move laterally through the small gate on the very back step into pens 2 or 5. We must remember that crushes on the Leppings Lane terrace happened at the boxing day derby in 1979, the 1981 quarter-final against Coventry, the 1981 semi-final and the 1988 semi-final. No-one died in any of those circumstances thankfully. 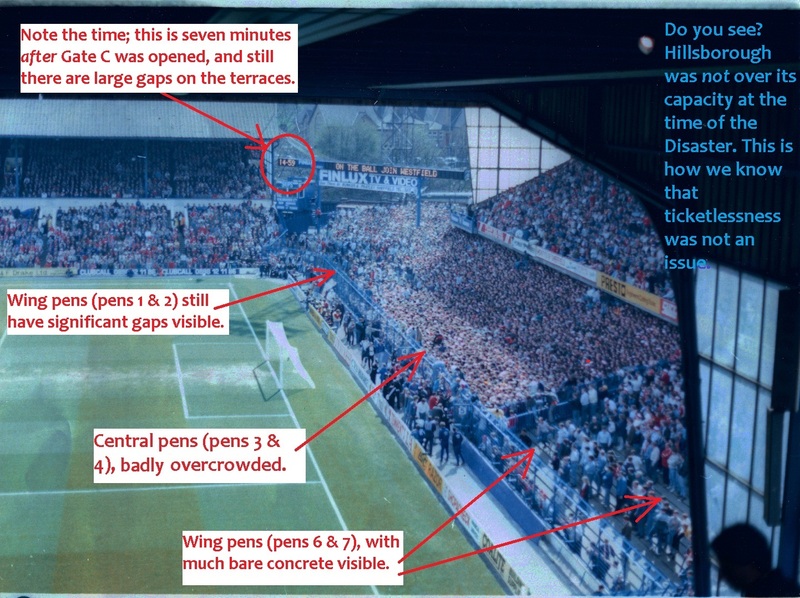 So four conclusions can be logically drawn...1) The Leppings Lane Terrace structure and entrances had fundamental safety issues, 2) The addition of pens allowing no lateral movement post 1981 played a factor in the deaths in 1989, 3) The change in policing methodology from 1988 to 1989 had an impact (I wont specify what exactly given the court case to come) and 4) Fan behaviour was unlikely to have been materially worse in 1989 than in 1988 (same fans) or 1981 (Leeds) or in 1979 (Sheff Utd). Some fans' behaviour will have been appalling for sure but if my four conclusions are correct then the fans can not be deemed culpable for the deaths occurring, even in part. Apologies - pressed send when I was half way done on an edit. The previous issues were of course 1979 Sheff Utd, 1981 Spurs/Wolves semi, (then a gap when the pens were installed) 1987 Cov quarter-final, 1987 Leeds semi final then 1988 semis both involving Liverpool. The fact is there is no footage or credible statements that back up any of that. If you have a link to the footage of horses being attacked outside the ground or statements that confirm this then I'd appreciate if you linked it here. Blimey you are sure of yourself arent you! What you mean is you havent seen any footage or credible statements that back up any of that.. it's not fact. and some video footage of aggressive fans.. and tbf aggressive police. See on 7 mins..
PS I could be wrong but i seem to recall at the time seeing more of this type of thing.. including someone trying to drag a copper off a horse. I cant find any on YT and i also had to go to a foreign language documentary to find the bit i did. It seems to have been omitted from the many other docs. Perhaps Whitewashed is too strong a word but because lies were told and exposed it seems to me that no one is allowed to suggest any fan involvement might have been a contributory factor in what happened. I dont think anyone believes the more outrageous claims of mass drunkenness or people stealing from the dead but i think anyone who was around football in that era is likely to think that there was some pressure put on policing at Hillsborough. That's not to say they caused the disaster but may have inadvertently added to the problems. iamofwfc and KelsoOrn like this. I am not disputing anything you say, apart from your conclusion. But you have even alluded to what I am getting at yourself. Your well written post deserves a longer reply, but most of isn't really relevant to the point I am making. You said that fans tried to turn back but couldn't. Well why? It was because more fans were still trying to push their way in behind behind them. Otherwise they could have turned round and walked away. Somewhere, in that large space between the external gate that was fatefully opened and the tunnel there were fans that still trying to get in the ground, despite other people trying to get out. If you look at the video footage of the people walking towards the tunnel as the game had started you will see there was plenty of space. They were held up as they reached the tunnel. There was a large roar from the crowd as Liverpool had a near miss at the far end, and maybe that made the rush to get in even worse. It really isn't difficult to understand what I am getting at. People were being squeezed by other people and somewhere at the back near the tunnel entrance others were making it worse, who were not being pushed by others behind them. As I said, look at that footage, the "yard" leading to the tunnel was not packed solid, there was plenty of space. As for the general discussion around the behaviour of the fans as a whole, then, in those days every big game was a problem. Liverpool were probably a bit worse than most, but not significantly in my opinion. But if they all behaved well on this occasion, then it would have been a first, quite honestly. But whether that sort of behaviour contributed to this disaster, I doubt very much. It was probably the general excitement of trying to get in to see a semi final, it could have happened to any set of fans. Regarding the cigarette burns on the police horses - the above document is very interesting, as the head of the veterinary services that was responsible for the South Yorkshire police horses in 89 (not entirely sure how the thing is/was structured) was interviewed in one of the many documentaries and stated that upon examination afterwards, no horses were harmed in any way, and that this information was passed on to the Hillsborough inquiry. I can't suggest that witnesses such as the above were "bought" to favour the police narrative, only that it conflicts with that statement hugely. I'm sure that one of the reasons why the inquiry took so long was because there was so many contradicting pieces of evidence that they had to go through. I abhor any kind of animal abuse, but if the above statement is true, the only conclusion I can think of is that if you're getting crushed outside a football stadium, and there's police horse in front of you taking up valuable room with an officer on it's back yelling at you, maybe you'd do anything to move it?? All conjecture on my part, may/may not have happened and I'd certainly like to think I wouldn't behave that way. But until I'm being crushed I guess I'll never really know. However, it does still amaze me that even after the inquiry, people believe that the fans were in any way responsible. It was a combination of multiple errors that resulted in the terrible outcome. The first blunder was not setting up the check points along Leppings Lane as had been done the year before - this would have prevented the bottleneck of fans at the stands entrance that lead to the crushing outside and would've allowed them in safely just as for the exact same fixture in 88 ( a lot of people seem to forget that the identical fixture was played the year before at the same ground). Secondly was the decision (or lack of) to close the gate to the already over crowded pens 3+4 - as had been done in 88. There was inadequate signage (virtually impossible to spot when full of people) directing fans to the side pens that were half empty. And thirdly was Duckenfield's decision to open exit gate C to relieve the crushing which resulted in huge numbers of people heading for the only entrance to the terrace they could see (and as has been pointed out, those that came through actually walked quite calmly to their doom, happy to be free of the outside crush). The panic and swearing/pushing outside the ground was caused by the crush of people stuck at the turnstiles due to the check-point blunder - gate C needed to be opened, but only after the gate for pens 3/4 had been closed. Duckenfield was looking right down on those pens and could see with his own eyes, as well as having cctv for both the gates mentioned. He had all the information he needed, but in his own words "froze". Then he lied to Graham Kelly and said that the fans forced gate C open. As has been mentioned earlier in the thread, the majority of those that died only got in to the ground after that gate was opened. I've no love for Liverpool FC at all - in fact, when I was a kid I hated them hugely because they were the best team by far (and they took Barnes and seemingly brain-washed him to be ill-informed of all things Pozzo related). But this is about so much more than football rivalry. The authorities messed up, and sought to shift the blame on to football fans because they were easy prey. It was proven during the inquiry that drunkeness had nothing to do it with it, that people were hardly "drunk" at all. All lies, as was the ticketless fans allegation. Just to be clear - the Police on the ground were also victims. Whenever we look at the failings of the South Yorkshire Police, it unfairly includes them in it. The chairman of the Hillsborough family support group, Trevor Hicks, has constantly stated that the officers he witnessed in action were heroes, and many of them have suffered terribly over the years as well. Not to mention the appalling act of the "higher ups" changing their written statements as to what they saw. The doctoring of the many police and witness statements is the clearest indication of an organisation(s) knowing they'd messed up. I hope Duckenfield and co see some lengthy jail time. Thanks for the blacksmith's statement I hadn't seen that before. As interesting as it is, as far as I can tell it doesn't specify what area of the ground the horse in question was used in. Not only could it have been Nottingham Forest fans who were responsible, but the abuse of the animal could have also occurred anywhere in the surrounding area of the stadium. I also understand that doubt has since been expressed about the validity of that report along with those of the police etc. as Jossy has mentioned above. As for the video footage posted; a brief flare up that seems to have arisen from overzealous policing and involves at most half a dozen Liverpool fans. Hardly supports the idea that Liverpool fans on a whole were unruly and contributed to the disaster. People are allowed to say whatever they like. However, people who express that sort of view will usually be picked up on it and directed to the facts and the findings of numerous independent inquests which show that the actions of Liverpool fans that day was not a contributory factor. It really is that simple. You speak about games you went to in the past where fans acted in an unruly manner. This more often than not didn't lead to many people losing their lives. Why do you think it was different at Hillsborough where the fans by all accounts were far better behaved than your previous experiences? You said that fans tried to turn back but couldn't. Well why? It was because more fans were still trying to push their way in behind behind them. Otherwise they could have turned round and walked away. Somewhere, in that large space between the external gate that was fatefully opened and the tunnel there were fans that still trying to get in the ground, despite other people trying to get out. A staggering misapprehension of basic physics. Thanks for the blacksmith's statement I hadn't seen that before. As interesting as it is, as far as I can tell it doesn't specify what area of the ground the horse in question was used in. Not only could it have been Nottingham Forest fans who were responsible, but the abuse of the animal could have also occurred anywhere in the surrounding area of the stadium. I also understand that doubt has since been expressed about the validity of that report along with those of the police etc. Just out of interest. Do you accept every single court/inquest verdict as 100% correct. No errors, no mistakes? Always right? Or is only when you want to agree with them?